I have 30 data sets. Each data set corresponds to a different value of eta. So data set 1, consisting of x values and y values, is for eta=0.2, then data set 2, consising of x-values and y-values, is for eta=0.25. 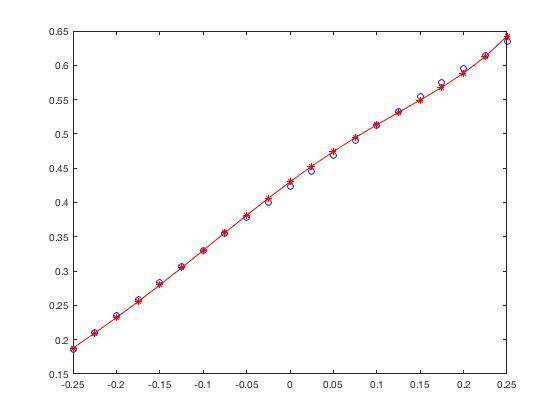 Does MATLAB offer a manner in which I can fit all of these simultaneously, where the solution is in the form of a polynomial, and it is a function of eta, x, and will have some fitted coefficients, so that each curve is fit properly? It would help to see the mathematical form of the model. Is the output a polynomial function of both eta and x? The output is a surface basically and I want to fit this to a polynomial of eta and x if possible. That is why I need to figure out how to take the Jacobian of the function example you gave, in order to change it when I change my function. You can use lsqcurvefit to do so, simply by posing the problem as a 30-parameter fit. If you do this, you will want to provide a sparse Jacobian calculation of your own. However, it might be more efficient, since your eta change gradually, to just run a loop over the data sets, each time initializing eta with the final value from the previous fit. I don't think I'm doing a good job explaining what I am trying to do. Eta is not a fitted value. For data set 1, eta = 0.2 (just a fact, not a fit). For data set 2, eta =0.25. For data set 3, eta=0.3. So the polynomial will be a function of eta, but I am not fitting eta. Does that make sense? I do not want 30 parameters either. 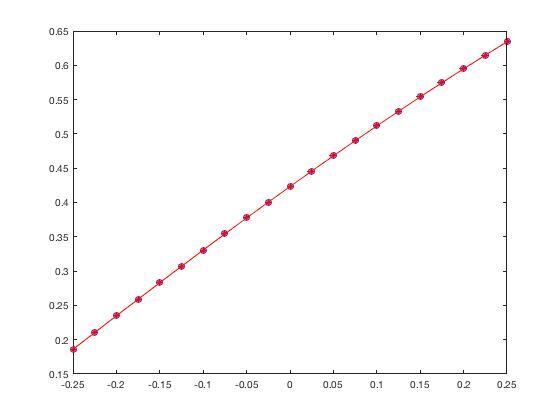 I have 30 curves that are each a function of x and eta. For a given x and a given eta, then I should get the correct y-value. Of course, I will need fitting coefficients. Imagine every curve is a fit of x and eta. To simplify, suppose I only have two cuves. Thus, I have data-set 1 and data-set 2. How would you go about fitting these to say coefficients of B1, B2, and B3, with known x-inputs, known eta for each curve, and known y-outputs? Also, I should note that each curve has a different amount of x and y values (as if it weren't complicated enough). So the function is a function of x and eta: f(x,eta)=y. Edit: Maybe instead of thinking of it as 30 different plots, just think of it as a single plot. But I have 2 variables. I have a y-value for a given x and eta. I want to fit this data. I'm somewhat confused if this would even work like I am describing. I just want a good fit but the data depends on 2 variables. Okay, but it doesn't really affect my answer. lsqcurvefit will let you fit a function of any number of variables, so if it is one single function of (x,eta) that you seek, it is well within the flexibility that lsqcurvefit offers. So suppose I have 3 columns. eta, x (inputs) and g (output). How would I use isqcurvefit for this? What should I put for the output and Jacobian? Where do I specify the type of function I want to fit to? How would I say I want to fit to a second order polynomial or something else? It is not like the Curve Fitting toolbox which offers a library of fit types for you to chose from. You must implement the specific expression for the ouput as a function of the coefficients and xdata, and similarly for the Jacobian. I certainly can't show them to you because I do not know the mathematical specifics of your model. Have you read the documentation and examples for lsqcurvefit, yet? I think it will be easier to have this conversation once you have. I am going through it but I am struggling to identify how to implement it. In the example, they define it for a single input xdata. Also, it appears that in their model, they define their function. In the example you gave me, I see that you create a function called modelfun, but where is the form of this function supposed to go? I also don't know the difference between coefficients0 and coefficients. I see inside the funciton you have my eta and x set to different columns in the xdata variable. So i can see that xdata will take these as inputs. What goes in outputs? Is it the functional form? Is it g (which is my y data)? I just want to start off with a simple polynomial. Could you give me an example that I could then tweak? modelfun is where the form of the function is supposed to go and yes "outputs" should be calculated based on the functional form of the model. The job of modelfun() is to take a guess of the unknown parameters and return a prediction of g based on that guess. coefficients0 is an initial guess of the unknown parameters that you must come up with and give to lsqcurvefit as the place to begin its iterative search. I am largely confused.Are there any full examples of using this function on a function of two variables like I want to do? I am still not sure what goes into output. Is it the functional form or something else? Can you provide a complete example, then I can try to understand what is going on? It would be helpful if you could pick any functional form so I can see it implemented. Also, I have no idea what i am supposed to provide for the Jacobian. All I want to do is get a polynomial fit to the data. OK. Here is an example of fitting the simple 2D planar surface g(x,y)=3*x+4*y+5. As I mentioned earlier I just have 3 column vectors. When I try to plot, I get that Z must be a matrix, not a scalar or vector. I am somewhat confused by this. I have 3 column vectors. x, eta, and g. Why can these not be used to create a scatter3 plot? You haven't copy/pasted your error messages for us (which you should always do), but I'm betting the error is coming from surf(), not scatter3(). See the documentation for surf to see its input requirements. I understand that surf requires a matrix, not a vector (which I have). How can I plot it then? I do not want to change my data. I tried this, but it seems like MATLAB is now hung. I've let it sit for several minutes. Any idea why additng these two lines of code would make the program go from instantaneous to very slow? Is it possible that now that the code works, the fitting procedure is just taking a long time? It seems like the values of a, b, and c are pretty quickly spit out, and now the code is just hung. If you have a,b,c the fitting procedure is over. It is the plotting where you are hung up. Just use ndgrid to and surf in the usual way to plot the fitted function over a suitable range. You don't have to use the same (x,eta) locations for plotting as that which you used for fitting. Yeah it seems like the plot isn't doing anything. I am using the last two lines of code to create the surface plot, why would it take so long to plot? I want to plot the surface over the whole range of the fitting. I need to visualize the whole thing. Should I just let it sit? What do you think is the bottleneck? It's because you are feeding something too big to ndgrid. Your eta nad x are not grid vectors. I am not sure what the usual way is. I can use the scatter3 to visualize my data points. Now all I want to do is plot the resulting surface of the form of the equation on top of it. great thanks! that helps a lot! Thanks for all the help! (1) Now that I have the code, I can play with the function and whatnot to get what I want. How do I quantify how good the fit is? (2) How worried about the Jacobian do I need to be. I used what you sent in the example. Will I need to change that if I change the functional form? Yes, you must compute the proper Jacobian of your model function. Or, you can set SpecifyObjectiveGradient to false and let lsqcurvefit approximate it for you, but that may make the fit less accurate and more time consuming. How is that computing the Jacobian? That is the analytical form of the Jacobian of g(x,y)=a*x+b*y+c. All the jacobian is, is setting it equal to both inputs and the size of x in values of 1? How would it change for a 2nd order polynomial? I thought the jacobian involved taking partial derivatives? I thought the jacobian involved taking partial derivatives? Correct. See also the link I posted. Why are we taking jacobian with respect to [a b c] and not [x y]? Because you are optimizing over [a,b,c]. Ok. 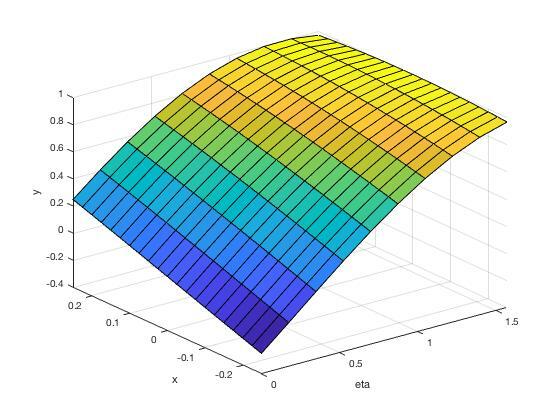 I had another question about the surface plot. 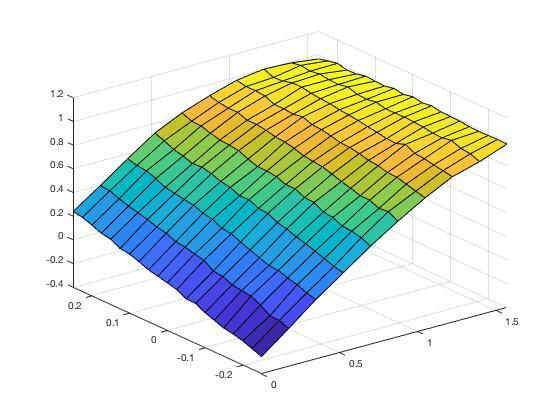 Is there a way for it to plot the surface in a way that x varies? In the attached picture, you can see that my blue lines are my data. And the surface should only go as far as x, but x varies with eta. Can I surface plot be modified to only show the surface up until the data stops? Also, will the residual of the surface and my data be computed properly, if the surface extends beyone where the data is? Can I surface plot be modified to only show the surface up until the data stops? You can set Z(i,j)=nan for any values that you do not want to appear on the plot. Also, will the residual of the surface and my data be computed properly, if the surface extends beyone where the data is? I don't see why it wouldn't. The surface you are plotting does not participate at all in the fitting. It is created after the fitting has completed. I'll wrap up this discussion here, and post more questions to a new thread. But lastly, when I asked if the residuals would be computed properly, you said "I don't see why it would" but then said the fitting was already done before the plotting. So I am guessing the residuals will be correct? Also, how would I calculate the accuracy? How do I incorporate [x,resnorm] into my code and get an output that shows the accuracy? "I don't see why it would"
Sorry, I meant "I don't see why it wouldn't". How do I incorporate [x,resnorm] into my code and get an output that shows the accuracy? resnorm is a measure of the accuracy - it is the norm of the residuals. Yes, I know it measures the accuracy, but how do I add it to my current code? Do I put resnorm after options? How can I actually add it? I tried typing in resnorm into command line after code ran and it says its undefined. How do I get the code to actually output resnorm? the default value of the optimality tolerance. Why do I not see the iterations and it seems its not stopping for the reason I expected. I cannot see what you've done, but the documentation for lsqcurvefit should explain it pretty well. I really appreicate all your help. I'll stop posting on this question, and will start a new thread if I have more questions. Thanks a lot for your help! There is also this example on the FEX explaining how to generate surface plots from a list of [x,y,z] coordinate triplets. The surface should cover only the x,y-region covered by your triplets. I'll suggest that while you CAN do at least something, it is perhaps not trivial. And, sadly, the result would likely be total, complete crapola. That will be more true IF these polynomials are of high order, or the data has a significant amount of noise in it. Is there some capability built into MATLAB to do it? Of course not. Software providers tend not to write code that nobody has ever requested, nor would they want to do it for good reason. But can you write it? Well, it is not difficult, at least in theory. You can think of each polynomial fit as a list of polynomial coefficients. There is no real gain from trying to do all the fits at one time. Polyfit would suffice, used in a loop. So create the entire set of coefficients, fo ALL values of eta. Now, just use interp1 to interpolate the coefficients for any given eta. The result will be another list of coefficients, at your chosen eta. For example, lets try something simple. So the surface is rather well-behaved. I would predict that for any value of eta, a low order polynomial will suffice. Effectively, I have just created a 2 variable function. Each column of y corresponds to a different value for eta, so effectively, we have different functions. In theory, I suppose a good way to solve this would be to create a 2 variable Taylor series. But lets assume we don't have that function. Over a reasonably short range, a low order polynomial might suffice. Again, if you need to use a high order polynomial for this, expect complete crapola, since high order polynomial fits tend to hugely amplify any noise in the data. That amplification will be reflected as almost random (and huge) noise in the coefficients. However, with no noise at all, we can do quite well here. For example, consider just one of those polynomial models. I'll use the curvefitting toolbox here for the fit, since it reports statistics around the estimated coefficients. Note that the bounds on the coefficients are actually pretty tight. Again, NO noise in the data was crucial. As well, this is a pretty simple function, very well behaved. So now, lets just form a big loop. I'll use polyfit. Those coefficients are actually pretty well behaved, but again, I was careful to have VERY good data. We can now use interp1 very simply, to predict the value of the function for any given eta. As you can see, the predictive power of the model is great. 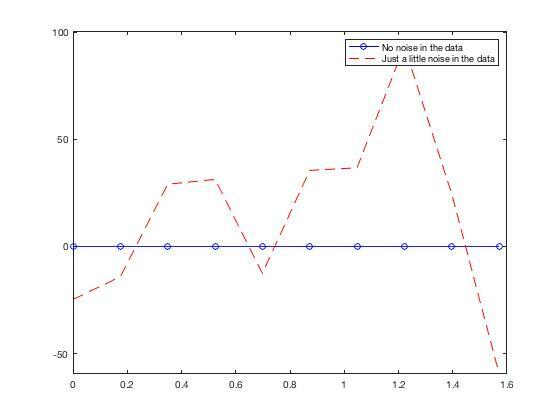 But that was without any noise at all in my data, and it was a reasonably low order polynomial model. And one other important fact is I used a vector x that was already centered and scaled, so the very best way to fit such a polynomial. So here we have some noise in the data. So a tiny amount of noise in y. What did it do to the coefficient of x^5 in those models? So a relatively tiny amount of noise, caused those polynomial coefficients to go to relatively insane. 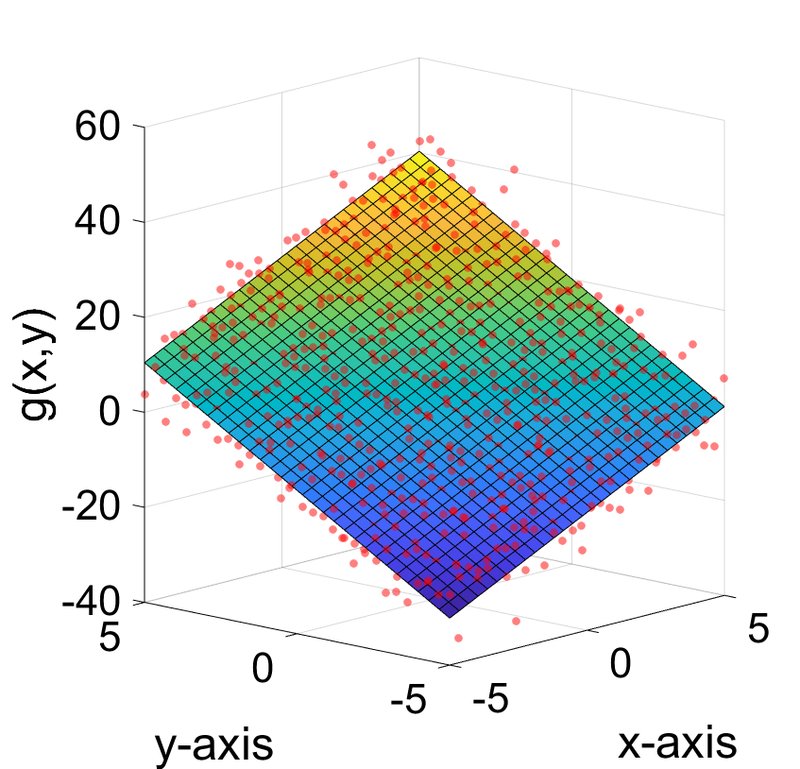 Luckily, this model is so close to being a linear one, over a short range in x, that the higher order interpolated polynomial coefficients were not that large and that nasty that we had a big problem. Again, things could easily have been worse, but as I said, this was almost a perfect case, where things will not be that bad, because the a low order polynomail fit will do quite well, and those high order coefficients were not too costly. So you CAN use an approach as I showed above. Will it work? Let me just say it is fraught with danger, and if you don't know what you are doing and what to watch out for, expect problems down the line, ESPECIALLY if you have any significant noise or you try to use high order polynomial models.